Is there a better alternative to Sequence Analysis? 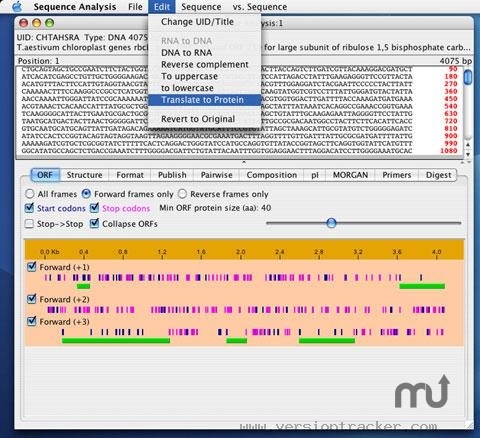 Is Sequence Analysis really the best app in Science category? Will Sequence Analysis work good on macOS 10.13.4? Sequence Analysis is sequence editing, reverse complement, protein translation, ORF finding, secondary structure, composition, isoelectric point, primer design, pairwise comparison, publish layout and sequence reformatting. Fetches sequence entries directly from the NCBI via Accession number or GID. Reads most sequence formats. This (Java) application is a collage of coding projects which I have written over the past several years for various clients in my work as a bioinformatics consultant. These clients have graciously allowed me to release these works into the public domain as freeware. Version 2.0.0: Release notes were unavailable when this listing was updated. Sequence Analysis needs a rating. Be the first to rate this app and get the discussion started!